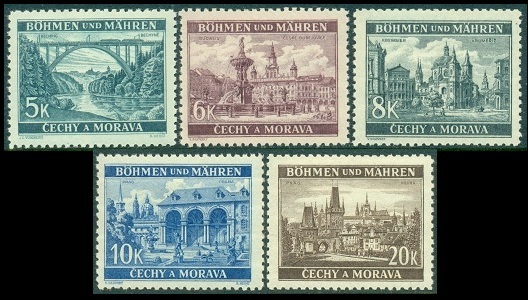 The Protectorate of Bohemia and Moravia issued the two charity stamps shown above (Mi. #53-54, Sc. #B1-2) on June 29, 1940 to publicize and raise money for the German Red Cross. The two stamps depict a Red Cross worker tending to a wounded soldier. The stamps were printed in sheets with alternating labels. The labels depict the arms of the German Red Cross with the date at the sides. The inscription "For the German Red Cross" appears in German above the arms and in Czech below the arms. Beginning in October 1940, the new definitive postage stamps shown above (Mi. #55-61, #64, Sc. #24A, #26, #43-48) were issued, utilizing the design types of the 1939 linden leaves and landscapes stamps. These stamps have the same printing attributes as those of the 1939 issue. The designs in the first image above depict linden leaves and Pardubice Castle. The designs in the second image above depict Lainsitz Bridge near Bechyne, Samson Fountain in Budweis, a view of Kromeriz, Wallenstein Palace in Prague, and a view of Prague. April 20, 1941 saw the issue of another set of stamps publicizing and raising money for the German Red Cross, as shown above (Mi. #62-63, Sc. #B3-4). These two stamps depict a Red Cross worker with a patient. The label designs are similar to that of the 1940 issue, with the exception of the date. In July 1941, eight more stamps of the 1939 linden leaves and landscapes definitive design were issued, as shown in the two images above (Mi. #65-72, Sc. #49-53C). The new linden leaves denominations were engraved, as shown in the first image above, and the designs show open buds, instead of the closed buds shown on the original linden leaves issues. The new landscape definitives shown in the scan above show designs previously used, but the new stamps are in different denominations and / or colors. They depict Prague Cathedral, St. Barbara's Church at Kutna Hora, Pardubice Castle, Bruno Cathedral, and Pernstein Castle. 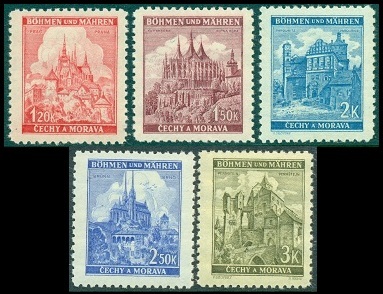 The Protectorate of Bohemia and Moravia issued the two stamps shown above (Mi. #73-74, Sc. #54-55) on August 25, 1941. They commemorate the 100th Anniversary of the Birth of Antonin Dvorak (1841-1904), the world renowned Czech composer. These stamps were printed in sheets with alternating labels. The labels show a branch across a harp, with "1841-1941" underneath. The four stamps shown in the image above (Mi. #75-78, Sc. #56-59) were issued on September 7, 1941 to publicize the Prague Fair. 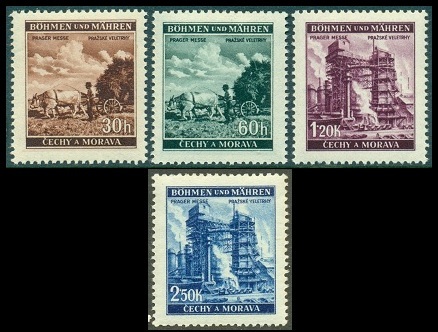 The two designs depict a farming scene and factories. The final stamps of 1941 were issued on October 26 to commemorate the 150th Anniversary of the Death of Wolfgang Amadeus Mozart (1756-1791), one of the greatest musicians and composers of all time. The set is shown above (Mi. #79-82, Sc. #B5-8). 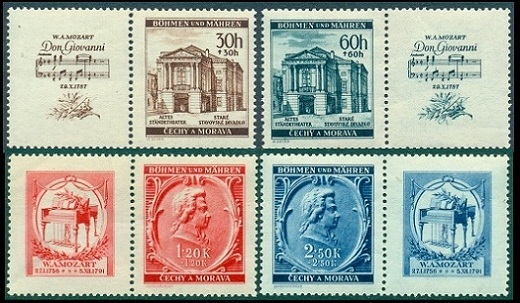 The two stamp designs depict the Old Theater in Prague and a portrait of Mozart. The adjoining labels depict two bars of Mozart's opera "Don Giovanni" and Mozart's piano.